Perfect for hanging out with friends, movie nights, making pizza together as a family or just relaxing and treating yourself! 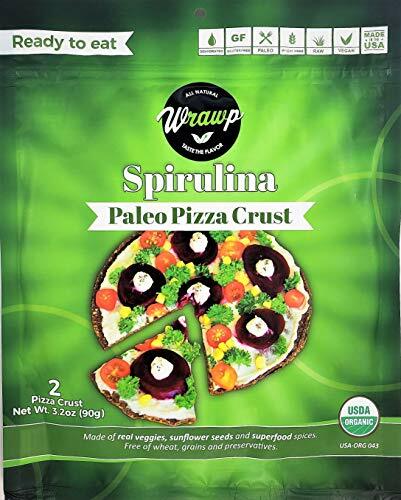 Having spirulina in these pizza crusts is a game changer that provides more health benefits than ever before! Spirulina is a great source of different vitamins including A, K1, K2, and B12. On top of that, it provides 3900% more iron than spinach. Can you believe it? Not only that, but spirulina helps boosts energy and speeds up weight loss. So many benefits that it could fill up this whole page. All Organic Ingredients: Carrot, Zucchini, Apple, Flax Seeds, Sunflower Seeds, Coconut, Black Salt and Spirulina. Ready to eat. It is dehydrated pizza, feels hard in package and will be soft after observing moisture of sauce and pizza topping. Cooking Options: Raw Pizza - just add favorite spread and topping, lets observe the moisture and its ready to be served. Baked Pizza: - add your favorite sauce and toppings and bake it up to 1 min at no more than 350F. If you have any questions about this product by Wrawp, contact us by completing and submitting the form below. If you are looking for a specif part number, please include it with your message.